A tangled web of land deals points to Zibi condo sales being subject to the axiom: buyer beware! Documents from the Ontario Land Registry Office, in the form of Service Ontario’s Land Registry records, show that Windmill Dream Zibi Ontario Inc. has a five-year lease that it bought for $2 from Domtar Inc. in June 2015 on parcels of land located on Chaudière Island. 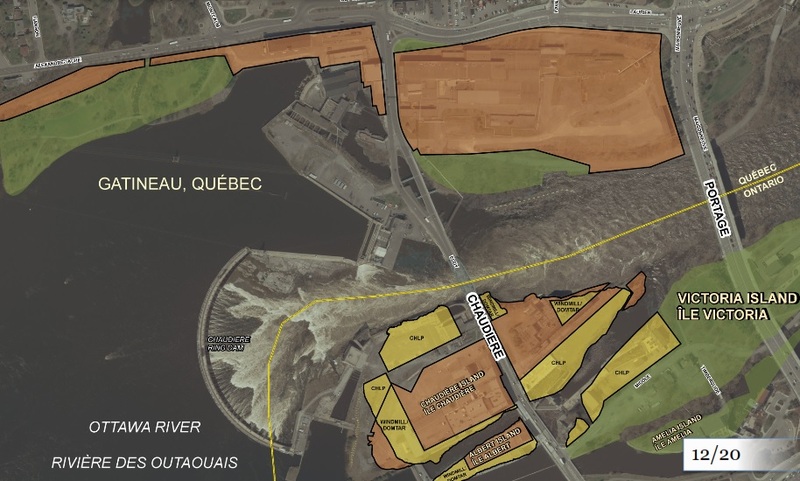 Windmill Development Group and its partner, Dream Unlimited Corp. have publicly claimed that the islands in Ontario where they seek to build condos in Ontario—not along the Gatineau shoreline, which is also part of the proposed development—are private property. This is true, but the owner of the property is not Windmill or Dream Corp.
“You can’t sell something you don’t own,” said Lindsay Lambert, an historian and researcher who supports Algonquin stewardship of the sacred islands and waterfall site that includes the Chaudière Falls, Victoria Island, Chaudière Island and Albert Island. Dream Windmill launched sales of Kanaal a 61-unit building located on Chaudière Island in November 2015. “Initial response has been fantastic,” said Windmill partner Rodney Wilts [as quoted in the Ottawa Citizen]. In February 2016, with 40% of the units sold, the condo developer launched Phase 2 of Kanaal sales. After months of sifting through records, Lambert has concluded that private land Windmill development group claims to own on islands in the Ottawa River is, in fact, leased from Domtar, which has in turn held historic long-term leases on the land from the federal government. “It’s not easy to sift through these land records and get to the truth,” Lambert adds. The evidence he has discovered appears in Parcel Register 04284-0144, on Page 2. Dated June 23, 2015, this record (PDF will load) records a notice of sublease from Domtar Inc. to windmill Dream Zibi Ontario Inc. The lease is valid for 5 years and the transaction carried a fee of $2. Lambert said he is concerned that the National Capital Commission (NCC) is being less than transparent about the status of land sales and ownership on the islands. The Domtar lands, which Dream Windmill is now leasing, were originally leased to Domtar from the federal government. A presentation by the NCC on Sept. 13 claimed to update its Board of Directors and the Public on its involvement with the proposed Zibi project (see 20-minute video). Unfortunately, the map the NCC provided at its meeting does not reflect the leasing reality that characterizes Windmill’s current holdings. Instead, the NCC is telling the public that areas in brown on the map are lands already owned by Windmill. According to the NCC, yellow represents land owned by the federal Public Services and Procurement Canada that will be transferred to the NCC, brown represents areas already owned by Windmill, and green shows NCC lands. Any transfer of lands from Public Services and Procurement Canada to the NCC and then to Dream Windmill will trigger the federal NCC’s need to consult with Indigenous people and groups. The most positive and accurate statement stemming from the Sept. 13 meeting is the one that acknowledges the Crown’s duty to consult. However, it is wrong-headed of the NCC to believe that Windmill (as the proponent seeking to benefit from an economic investment) can continue to be involved in such consultations. When the NCC announced its support for the islands’ condo development, it said that its support was conditional on consultations with Aboriginal groups. It botched the early days of acting on that promise by turning those consultations over to Windmill Development Group. Now, the time has come for the NCC to make good on a promise to set up consultations that respect and accommodate the perspectives of Indigenous people. To date, those consultations have been behind closed doors and have often included the proponent (Windmill). If the NCC is serious about discharging its duty as a Crown entity, it should consider making those consultations public and ensuring that no group—especially the corporation that stands to benefit from branding its project with an Algonquin name—has a special seat at the table. All of the interested players need to be treated as equals.